Here my tutorial on dying wigs with multipurpose fabric dye (Cotton/wool/nylon) on heat resistant wigs. 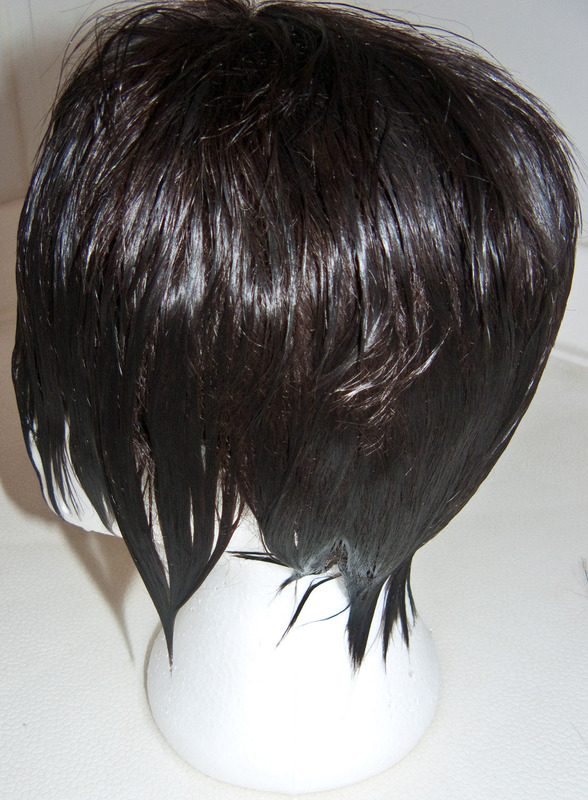 The fiber types are Hiperlon (has natural hair texture and thicker, made in Korea), Powerlon (referred to Japanese heat resistant fiber, silky smooth in texture), and Henlon (which most Chinese heat resistant fiber and seller use, looks a little too shinny/plastic). 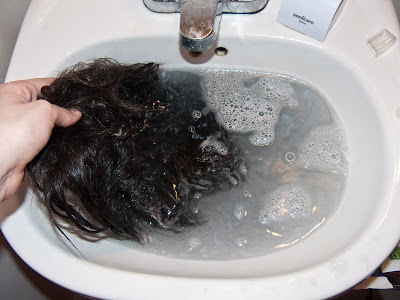 This will not work on natural hair wigs (doesn't colour fast) or on regular synthetics wigs (the method ruin the fibers or melts them). 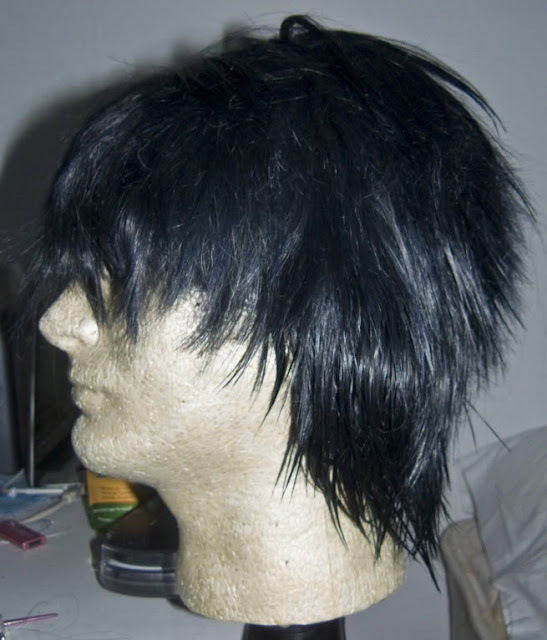 What you will need for the wig! 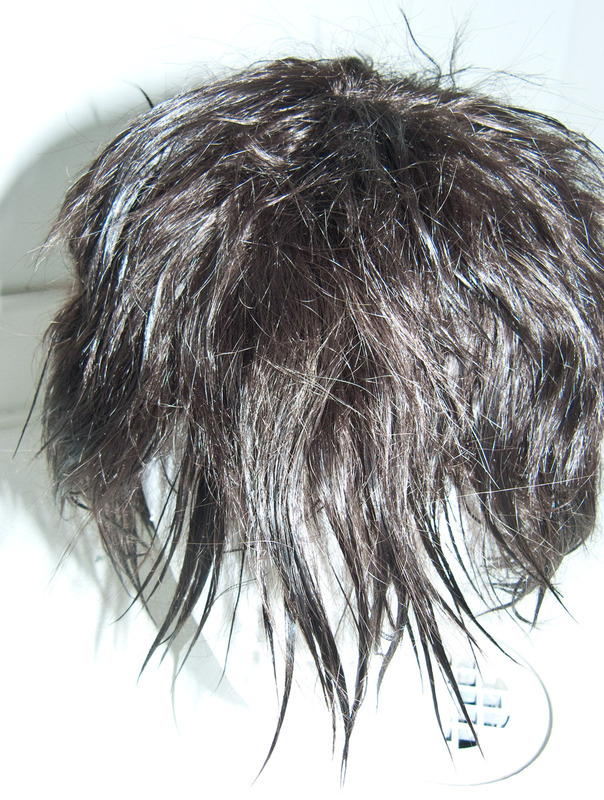 You can purchase your supplied from Ard Wigs (with international options) or Arda Wigs Canada. 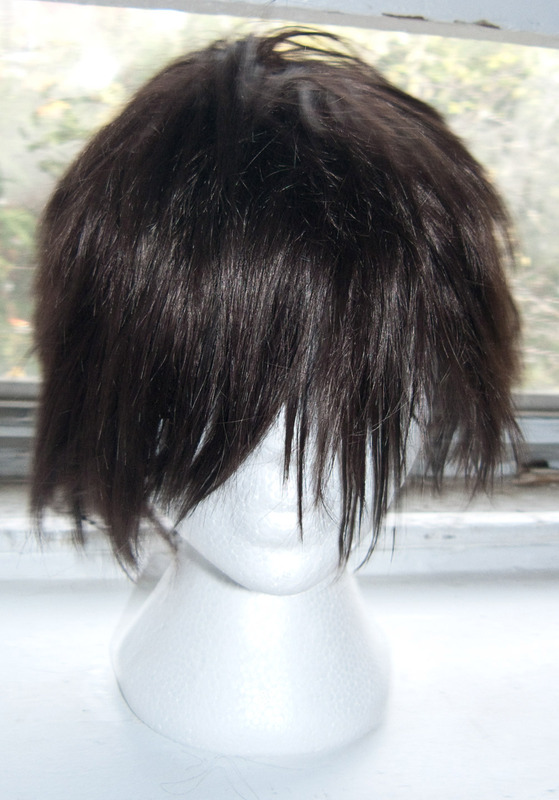 This shade was the darkest brown Arda has to offer and I wanted a blackened brown shade for the character. Cut Dylon tin with a knife to open it or open the RIT dye back pouch. 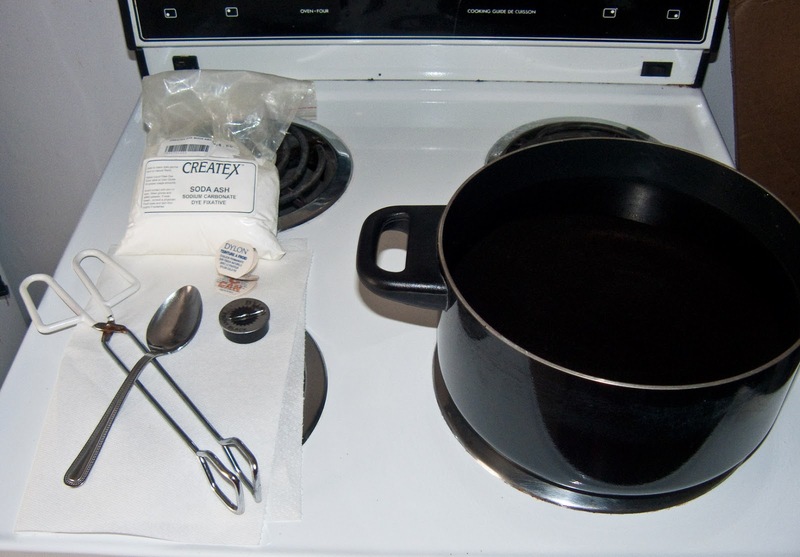 Pour dye powder into pot and mix, pour teaspoon of soda ash or salt into the pot and mixer thoroughly. 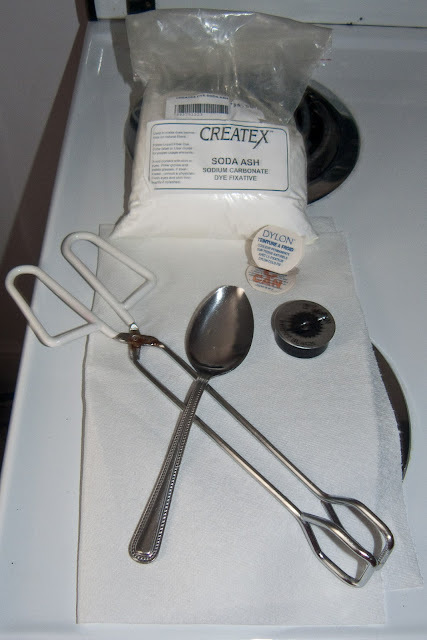 Note: the amount of Soda Ash or salt need for the dye will be outlined in the fabric dye instructions. 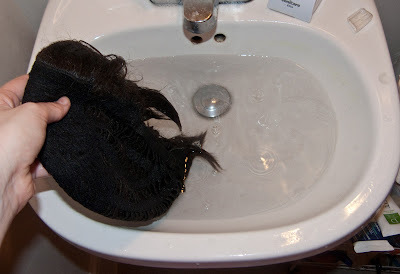 Using your tongs, submerge your wig. 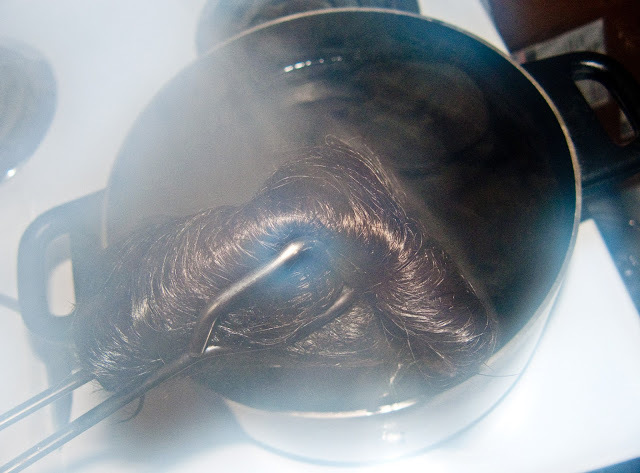 Use the tongs to move the wig about the pot and push it back down if it boils up to the surface. The colour you get depend on the time you leave the fiber submerged in the shimmering pot. 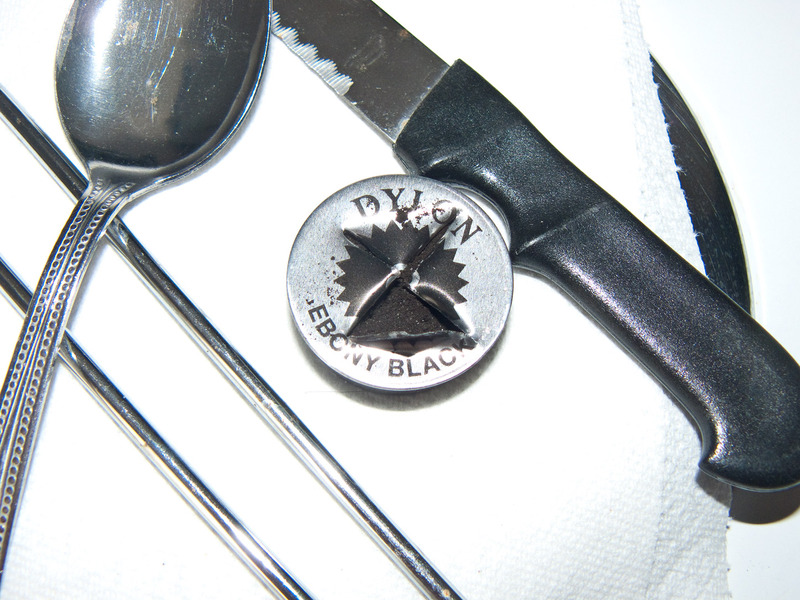 Ebony Dye on 063 Silver from Arda. The lighter swatch is after 10 minutes in the dye bath. 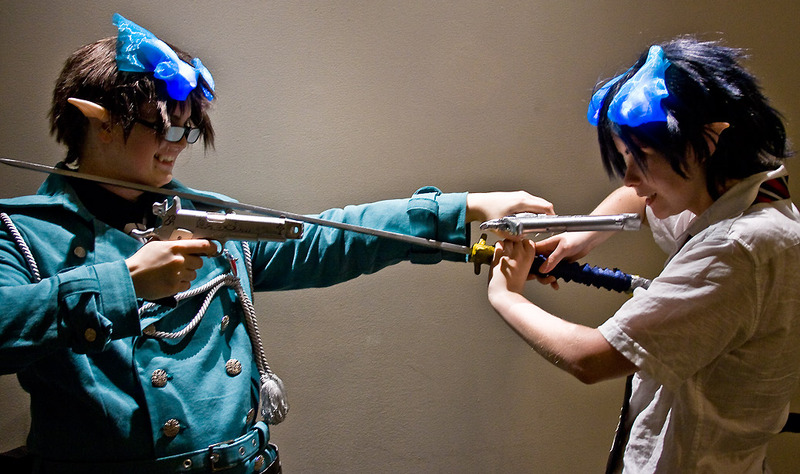 The darker one is after a full 30 minutes. It doesn't get any darker. Do for the black out only achieve about 50% of the true shade of the black. You can also pull out you wig and rise before 30 minutes are up to see if you like the colour you achieved. 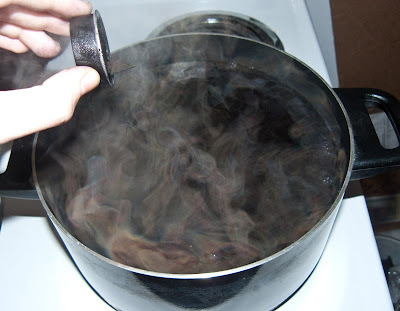 If the shades not deep/strong enough you can put it back into the pot for another 30 minutes to restart the dye process. 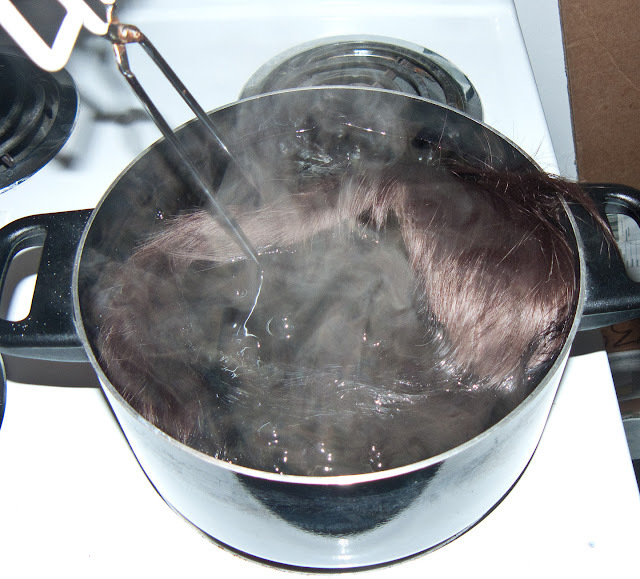 Once you hit the dye colour you want (in this case 30 minutes) pull the wig from the pot and into another container for transport. This way the water/dye in the wig won't drip on the floor. 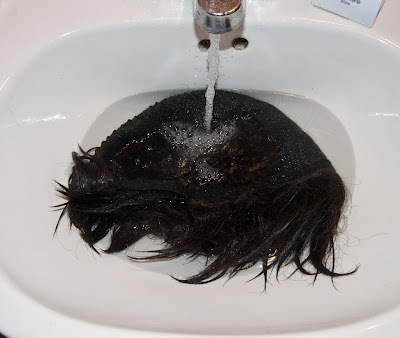 Wash and rinse your wig. 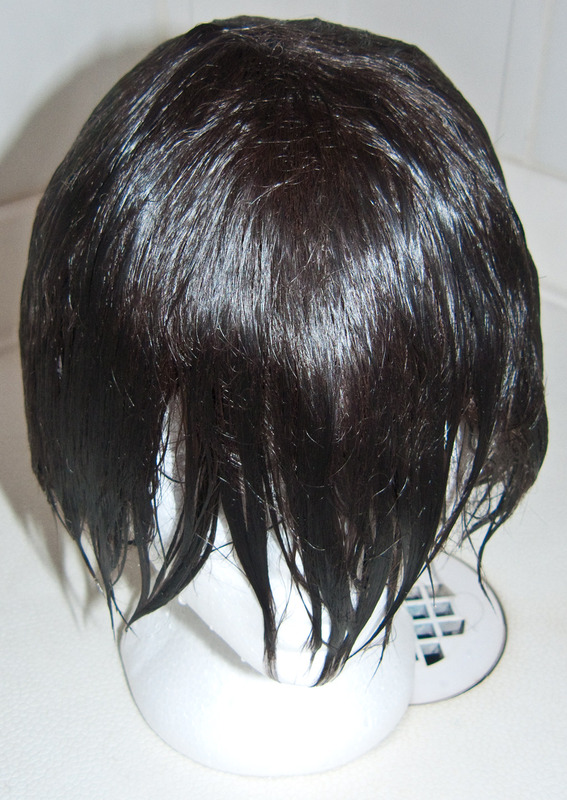 You will need to wash it 3 times to get the residual dye mostly out netting and elastic on the wig but the colour is permanently baked into the wig fibers. 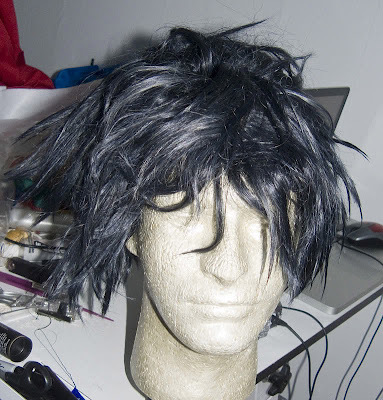 Rins wig looks even more wild as it is a bit longer. I also over shimmer it by an extra half hour. Straighten the wig back to normal. First pin your wig to a foam head then us a kettle to boil water in. 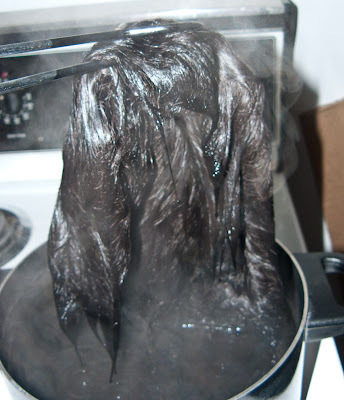 Then pour the kettle over the wig. I do this in my shower. I usually have to do this twice for short with to cover all the heat. The heat and the weight of the water will pull the hair smooth. 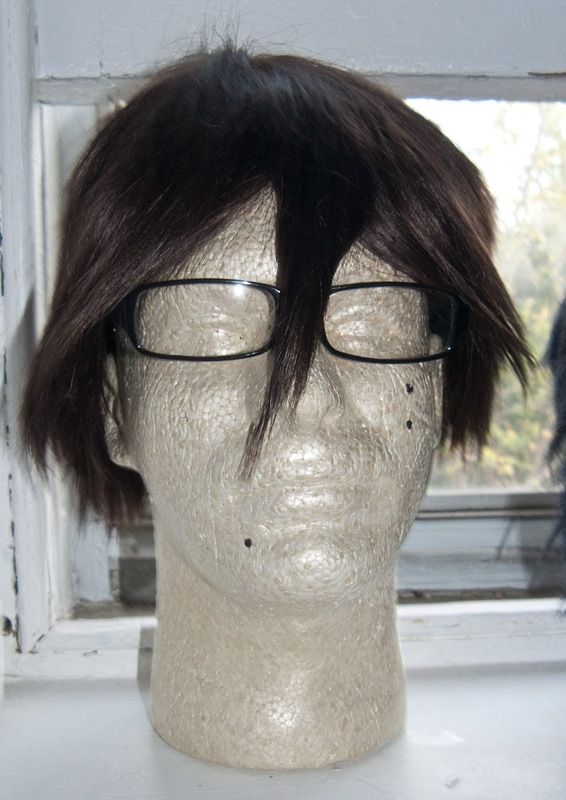 Here is an example of me just brushing out those crazy waves in Rin wig as I wanted the texture it had. 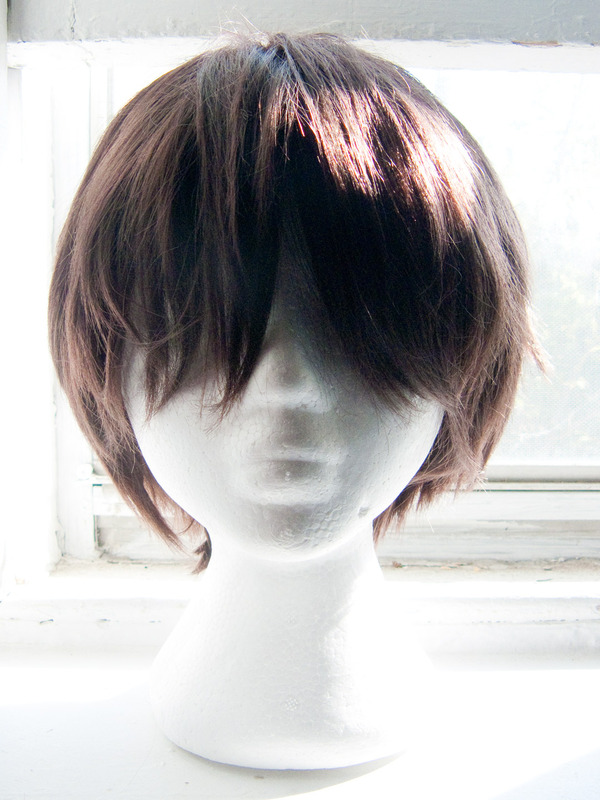 I still needed to work a straightening iron on it to take out some the puffiness in areas. 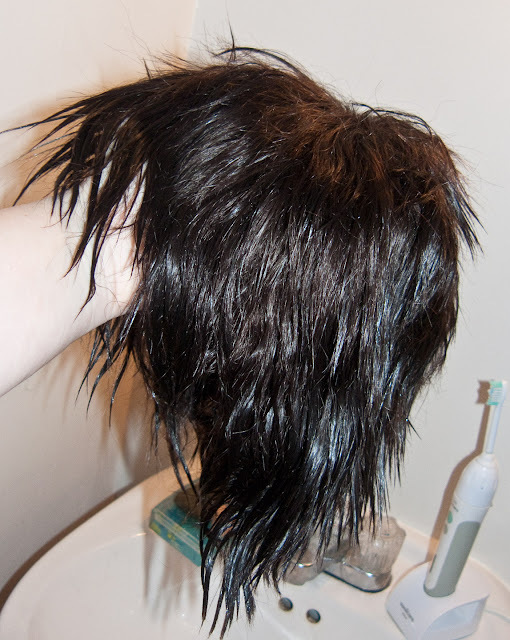 This is the easiest dye method I've works with on wigs, although the hair needs to be straightened again as the heat ads waves to the fibers. I like the fact it produces a permanent dye to the fiber unlike with Sharpie Method which can be lifted with hairspray if your not careful and it doesn't change the texture of the wig like Acrylic inks (FW ink) can. The downside is that you won't achieve a pure tone of the dye as it only a percentage of dye true colour on natural fibers like Wool or Cotton but it's darker then the shades you achieve with Nylon. 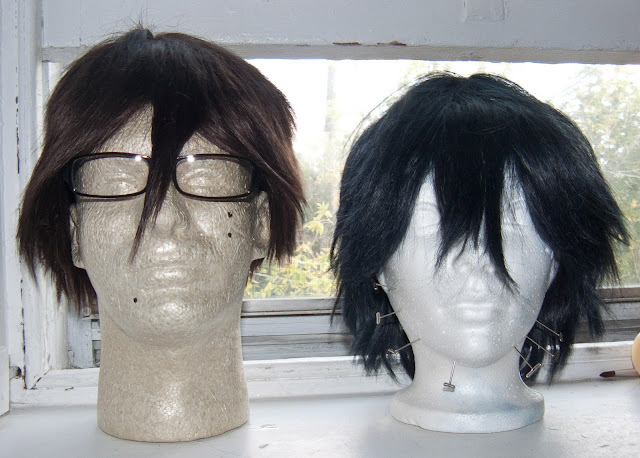 So keep in mind when using this method for your wig you want to dye a wig that is closest to the final shade but lighter then dye it darker/more colour saturated to match the finally result. 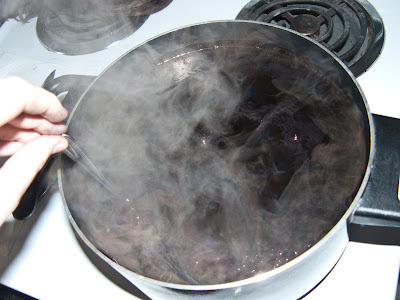 Also that some dyes will dye deeper/stronger. In this case, test the colour every 10 minutes to see how far the shade as saturated the fibers. Also it turns out that Dylon is discontinuing their tin formula (maybe why my local stores haven't been updated their stock the past year. lol). 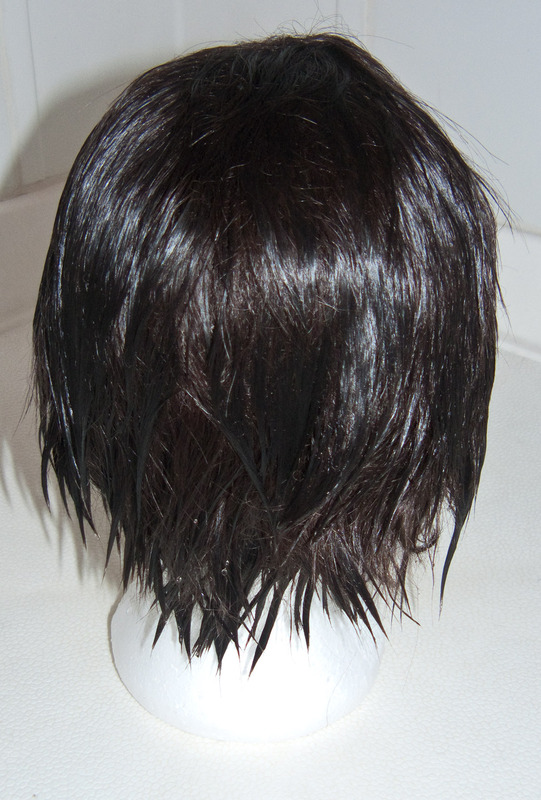 The new Dylon Hand Dye formula is not rated for Nylon which means it's not going to bind the to the wig structure as well. 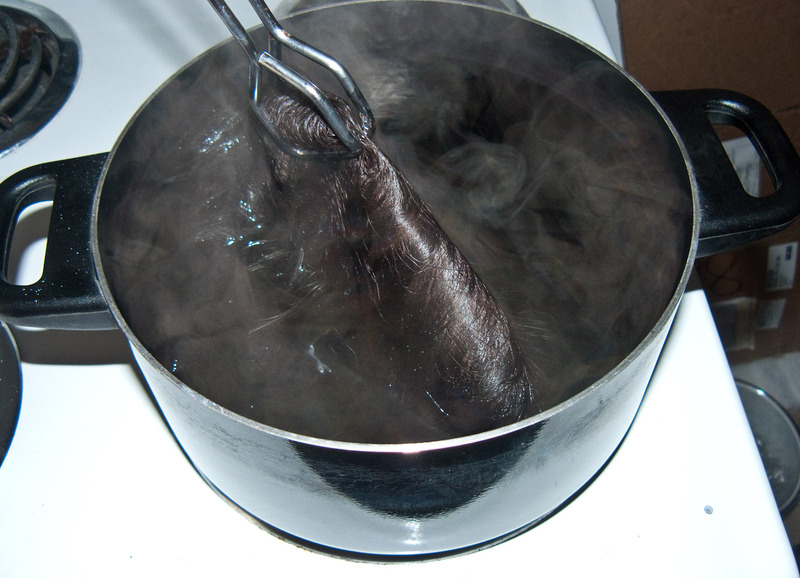 >_< When selecting a general fabric dye make sure is nylon rated. ;) RIT still is. 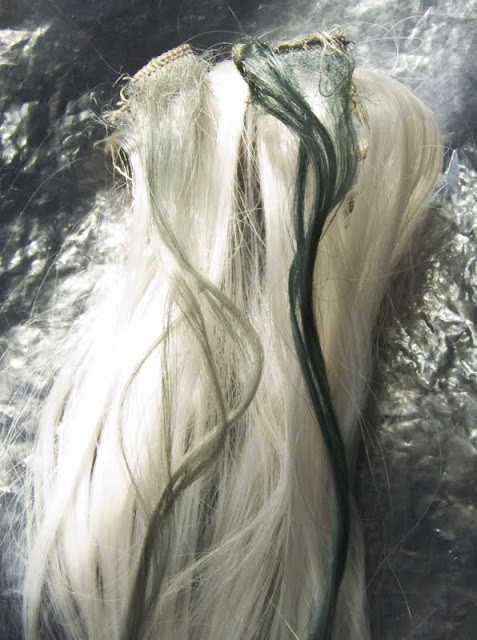 You can see examples of Rit and IDye Poly shades and their dye times here.